From November 3 through November 14, 2017, President Donald J. Trump traveled to Japan, the Republic of Korea, China, Vietnam, and the Philippines on a lengthy tour of East and Southeast Asia. The White House described the trip as focused primarily on three issues: “strengthening international resolve to denuclearize North Korea, promoting a free and open Indo-Pacific region, and advancing American prosperity through fair and reciprocal trade.”1 With the jaunt concluded, and associated follow-on developments having wrapped up as well, it is now possible to offer an evaluation of the president’s trip. Did it narrow or deepen political divisions in Asia? Clearly substantial political tensions in Asia predated the Trump trip and indeed the Trump presidency. This article treats probably the most important foreign trip of Trump’s first year in office and the longest to Asia by an American president in nearly a quarter century as an opportunity to both look back at where things stood a year ago and to look ahead. It reviews the state of Asian political and security affairs and explores how these are evolving in light of key political relationships. This sojourn overseas appears to have further focused regional actors on the imperative of confronting North Korea and introduced a new formula (a ‘free and open Indo-Pacific’) and the “Quad” (the United States—Japan—Australia—India) for constraining China’s influence, while somewhat aggravating a number of other tensions and at times calling into question US competence and influence. At the conclusion of the Obama administration, a number of key challenges were already evident that any successor would have had to deal with. Key among these were the burgeoning North Korean nuclear challenge, China’s growing assertiveness under Xi Jinping, and an erosion of democratic governance and a concomitant decay in the US alliances with the Kingdom of Thailand and the Republic of the Philippines. These are discussed below. Trump’s team made five major shifts in US policy towards Asia prior to his November 2017 trip. First, the president immediately pulled out of the Trans-Pacific Partnership (TPP), removing the regional economic component of US Asia policy. Many Asian nations saw this decision as severely weakening the US ability to counterbalance China’s economic influence. In short order, Xi Jinping, speaking at the Davos World Forum, announced that China would “remain committed to developing global free trade and investment, (and) promote trade and investment liberalization.”14 While Xi’s remarks were regarded as risible by many observers, they nonetheless served notice that he intends to position China, rhetorically as well as through its Belt and Road Initiative (BRI) and the Asian Infrastructure Investment Bank (AIIB), to capitalize on a widely perceived abdication of American regional economic leadership. Third, Secretary of State Rex Tillerson announced, “the policy of ‘strategic patience’ with North Korea has ended,” leading eventually to what was described as a policy based on “maximum pressure and engagement.”18 This substantially elevated the priority for stopping the North Korean nuclear and ballistic missile programs through a campaign of military pressure, economic sanctions, and global diplomacy aimed at encouraging third countries to downgrade or cut off trade and diplomatic ties with Pyongyang. American officials also occasionally hinted that the goal of US policy was not regime change and suggested an openness to dialogue, but conflicting messages clouded such signals. In particular, the president’s repeated exchange of personal insults with Kim Jong-un, together with the clear desire to back out of the Joint Comprehensive Plan of Action (JCPOA) with Tehran (the Iran nuclear deal), made it even more difficult to imagine Pyongyang’s leadership agreeing to any negotiations aimed at getting them to give up their nuclear weapons. Finally, the administration’s lead diplomat on Asia, Acting Assistant Secretary of State for Asia-Pacific Affairs Susan Thornton, proclaimed in March that the administration would not be continuing the ‘rebalance’ to the Asia-Pacific of the Obama administration.20 While many observers perceived this as something more akin to dropping the branding while keeping the content, a strong case can be made that the Trump administration was serious about abandoning the content of the ‘pivot’ as well. While the focus of that policy was on balancing, shaping, and constraining the growing power and influence of China, the Trump administration’s focus throughout much of its first eleven months was on addressing two more immediate challenges: North Korean nuclear threat and the deficits in bilateral US trade relations with key Asian nations. The president’s early antagonism toward China over its currency manipulation and artificial island-construction in the South China Sea appeared to have dissipated by the time of President Xi’s visit in April, when the two leaders established “great chemistry,” as Trump later related, over “the most delicious piece of chocolate cake you have ever seen,” with Trump also relating that he had learned from Xi that “Korea actually used to be a part of China.”21 In short, the Trump team had induced some substantial concerns among allies and partners in Asia through its first ten months. Inasmuch as the visit to Tokyo brought the United States and Japan closer and offered succor to regional states worried about whether or not the United States still intends to shape the future evolution of the Asia-Pacific, the trip brought countries together. Of course, for North Korea and China, the trip was likely seen as more divisive since it focused on how to strengthen cooperation so as to resist the ambitions of Asia’s revisionist states; for some on the Korean left, too, President Trump’s call for Japan to purchase more arms was alarming since many Korean progressives see a more militarily capable Japan as a threat. Following his time in Japan, Trump traveled to South Korea, where he encouraged South Koreans to buy more US weapons and reaffirmed the US commitment to stop North Korea’s nuclear program.25 While he successfully visited Pyeongtaek, where the new Camp Humphreys facility houses US Forces Korea (USFK), and met with USFK Commanding General Vincent Brooks, his plan to visit the demilitarized zone by helicopter had to be waived off due to fog in the area.26 During the state dinner that President Moon Jae-in’s team arranged for the visiting American president, however, the Korean side engaged in a pair of symbolic actions intended to use the US leader’s visit to signal Korea’s discontent with Japan. First, the Korean side invited to the state dinner a ‘comfort woman’ survivor who had railed against the December 2015 Japan-South Korea deal on this sensitive issue and had her photographed hugging the American president. Then, the menu contained a dish made with “Dokdo shrimp,” a reference to the South Korean island that Tokyo also claims and calls Takeshima. Both of these moves were immediately perceived by senior Abe administration officials as attempts to humiliate Japan, and they made clear their frustration with South Korea’s decision to engage in such actions.27 It is not clear whether the Trump administration simply failed to understand the implications of the South’s actions, was caught off guard by them, or registered any dissatisfaction with these bilateral South Korea-Japan issues being brought into a US-South Korea context. The China portion of the trip exceeded all of Beijing’s wildest hopes; Chinese experts who have visited the United States since the trip describe it as a highly successful visit. North Korea likely did not feel comforted in seeing Beijing and Washington appear to be on such friendly terms. By contrast, Japan, Taiwan, Vietnam, and India—the countries most at odds with China—were concerned by the prospect of Washington setting aside efforts to counter China’s growing regional influence in order to extract more narrow, reversible promises on North Korea and trade. While none of these countries—nor others such as South Korea, the Philippines, or Australia—wants to see bad US-China relations, they are also equally fearful of the prospect of being “abandoned” or having deals made over their heads. To Japan, Australia, and India as well as smaller countries in Southeast Asia worried by China’s rise, Trump’s efforts to build up Vietnam’s security and defense capabilities, bolster bilateral military ties, and encourage it to contribute to a “free and open Indo-Pacific” were welcome. China, by contrast, surely saw these developments as unhelpful and Trump’s offer to mediate the South China Sea dispute as particularly unwelcome, though there are no signs that the offer was part of a deepening American commitment to the resolution of the dispute nor that it was taken seriously by the Vietnamese side. Other claimant states in the South China Sea would probably also not welcome such US arbitration unless they were consulted in advance; there is no publicly available evidence that they were so briefed. Distracting from the relatively positive elements of the visit to Vietnam outlined above were a pair of unanticipated events. First, Trump turned once again to Twitter to respond to an insult by North Korea, which referred to him as an “old lunatic,” tweeting back, “why would Kim Jong-un insult me by calling me ‘old,’ when I would NEVER call him ‘short and fat?”35 Then, Trump met with Russian leader Vladimir Putin on the sidelines of the APEC summit and reported to the media afterwards that Putin had again denied Russian meddling in the US election and that he appeared to be sincere in his denials.36 These developments generated substantial negative publicity, and this overshadowed much of the positive news generated by the trip to Vietnam. The outcome of the visit to the Philippines was welcome news to Tokyo in particular, which had devoted substantial efforts to keep Manila from slipping too far into Beijing’s orbit.42 From Beijing’s perspective, a renewed US-Philippines alliance could carry some risks, though the agreements announced during the visit was not so great as to pose substantial concerns to China. While Trump’s trip to Asia was clearly important, a number of other developments occurred simultaneously or in short order after his trip, which are worth mentioning inasmuch as they helped to shape the context in which the trip unfolded or against which its meaning is being interpreted. First, following the conclusion of the US-South Korea summit, Moon flew to Jakarta on November 9, where he announced a major initiative to reduce South Korea’s dependency on the United States for security and China for economics by building ties with ASEAN.45 Although not framed as contributing to the “Quad” arrangement, Moon’s move, focusing more attention on Southeast Asia, could make positive contributions to a “free and open Indo-Pacific.” However, if the intention is more focused on rebalancing diplomatic relations away from Washington, such an initiative would no doubt be seen negatively. It is still early to tell whether Moon’s visit adds momentum to the outcomes of the Trump trip or detracts from them. Second, while Trump was still in Asia on November 10, Japan and the other ten negotiating members of the TPP finalized a revised version of the trading arrangement, dubbed the Comprehensive and Progressive Agreement for Trans-Pacific Partnership (CPTPP).46 This advances Abe’s efforts to shape the region’s economic future in a direction away from overreliance on the Chinese market, and in so doing provides an economic leg for the Quad or other regional initiatives aimed at a “free and open Indo-Pacific”’ to stand on. This was not welcome news in China, but it also highlighted the failure of the US administration to exercise leadership on regional economic integration. Third, on November 28, North Korea tested an intercontinental-range ballistic missile that might be capable of ranging most of the continental United States.47 This fueled concern that the region might be slipping towards war, with the United States moving up strike assets, one Jilin provincial newspaper informing its Chinese readers about how to survive a nuclear war, and prominent Chinese government advisors declaring that Beijing must “prepare for imminent war with North Korea.”48 Such developments deepen political divisions in Asia, and may heighten the prospects of inadvertent or accidental escalation that could lead to war. Fourth, on December 1, the Trump administration’s first national security advisor Michael Flynn pleaded guilty to one count of lying to the FBI, fueling speculation that the investigation by Special Prosecutor Robert Mueller might ultimately bring down the Trump administration.49If America is absorbed by its own domestic political controversies, it may make the political divisions in Asia worse since countries hostile to the US-led order may seek to take advantage. Fifth, Australia’s own long-brewing foreign influence-peddling scandal blew up shortly after the conclusion of the Trump trip to Asia, with Labor Party Senator Sam Dastyari resigning his seat in Parliament on December 12 over allegations of improper contact with suspected Chinese agents.50 This development may further Canberra’s commitment to stand shoulder-to-shoulder with Washington, Tokyo, and New Delhi in opposing Chinese efforts to erode or undercut democratic norms and international law in the Indo-Pacific, though the aftermath of the Dastyari scandal remains to be seen. It is unclear if the Moon administration believes that such a joint China-South Korea commemoration of resistance against Japan will contribute positively to a “free and open Indo-Pacific.” Indeed, the decision to turn Moon into a cat’s paw for Beijing to deploy against Tokyo undercuts any sense that Trump’s visit had further brought South Korea and Japan together to confront the near-term threat of an aggressive North Korea and the longer-term threat of a revisionist China. Repaying South Korea’s willingness to serve as China’s anti-Japan tool, Beijing snubbed the South Korean leader by sending only a vice-ministerial level to the airport for Moon’s arrival, and subsequently declined to issue an invitation to him to dine with Prime Minister Li Keqiang for lunch. Topping it all off, members of the president’s traveling media entourage were brutally assaulted by Chinese security personnel as the reporters attempted to enter a trade show where Moon was due to make some remarks.52 South Korea’s diplomatic efforts to repair ties with Beijing by collaborating on anti-Japan initiatives highlight the continuing challenges that US policymakers will confront, even among allies, as they seek to build a coalition of partners in the Indo-Pacific. Still, the challenges posed by a nuclear North Korea and a rising, revisionist China were not solved by the trip, and it is unclear that anything Trump said or did during his trip substantially advanced efforts to meet these threats. Additionally, real or perceived US inattention or indifference to issues such as South Korea-Japan tensions, human rights in China, Vietnam and the Philippines, and the absence of a regional economic framework that includes the United States call into question the ability of Washington to continue to exert leadership in the region. America’s domestic political challenges, including both the investigation into the Trump campaign’s contacts with Russia and the decision of the Republican-led Congress to press forward with a massive $1.5 trillion tax cut that would eat into resources needed for modernizing the US military add even more doubt. Trump’s trip to Asia gave some additional impetus to trends already afoot in terms of the regional reaction to North Korea’s aggressive nuclear and missile development but did not solve the problem. It laid down a marker on the goal of a “free and open Indo-Pacific” without clearly explaining the exact meaning of the phrase, what course of action would be necessary to achieve it, how it ranked as a priority compared with other US policy goals, or how it would be resourced. Perhaps more clearly than anything else, Trump’s trip to Asia showed that while the United States is still an important player in the unfolding evolution of the security environment in the Indo-Pacific, it is today but one of many actors in a region whose key leaders are increasingly capable of and inclined towards advancing their own visions of the future, many of which are sharply at odds with each other. 1. “President Trump’s Trip to Asia,” The White House, November 3, 2017, https://www.whitehouse.gov/blog/2017/11/03/president-trump-trip-to-asia. 2. David Albright, “Future Directions in the DPRK’s Nuclear Weapons Program: Three Scenarios for 2020,” Institute for Science and International Security, February 26, 2015. 3. US Department of Defense, “Military and Security Developments Involving the Democratic People’s Republic of Korea” (Washington, DC: US Government Printing Office, 2015). 4. Jenny Jun, Scott LaFoy, and Ethan Sohn, North Korea’s Cyber Operations: Strategy and Responses (Washington, DC: Center for Strategic and International Studies, 2015); on the hacking of the South Korean military’s access to the joint US-ROK war plans, see Choe Sang-hun, “North Korean Hackers Stole US-South Korean Military Plans, Lawmaker Says,” The New York Times, October 10, 2017. 5. Bruce Klingner, “North Korea Heading for the Abyss,” The Washington Quarterly 37, no. 3 (Fall 2014): 169 – 182. 6. David Nakamura and Anne Gearin, “Obama Warned Trump on North Korea. But Trump’s ‘Fire and Fury’ Strategy Wasn’t What Obama Aides Expected,” The Washington Post, August 9, 2017. 7. Camilla T.N. Sørensen, “The Significance of Xi Jinping’s ‘China Dream’ for Chinese Foreign Policy: From ‘Tao Guang Yang Hui’ to ‘Fen Fa You Wei,’” Journal of Chinese International Relations 3, no. 1 (2015): 53-73; Robert Blackwill and Kurt Campbell, “Xi Jinping on the Global Stage: Chinese Foreign Policy under a Powerful but Exposed Leader,”Council Special Report, no. 74 (New York, NY: The Council on Foreign Relations, February 25, 2016). 9. Oriana Skylar Mastro, “Why Chinese Assertiveness is Here to Stay,” The Washington Quarterly 37, no. 4: 151-170. 10. Adam P. Liff, “China and the U.S. Alliance System,” China Quarterly, April 24, 2017. 11. Bilahari Kausikan, “Asia in the Trump Era: From Pivot to Peril?” Foreign Affairs (May/June 2017). 12. Chun Han Wong, “In Setback to US, Philippines Sets Aside Dispute with China,” The Wall Street Journal, October 20, 2016. 13. Victor D. Cha, Alignment Despite Antagonism (Stanford, CA: Stanford University Press, 1999). 14. Thomas E. Kellogg, “Xi’s Davos Speech: Is China the New Champion for the Liberal International Order?” The Diplomat, January 24, 2017. 15. The administration did criticize China over its detention of Taiwanese activist Lee Ming-che and the president himself described North Korea’s human rights violations in explicit terms, especially after the death of the 22-year old American Otto Warmbier. But Chinese human rights violations were rarely mentioned, nor did the administration appear particularly focused on the genocide against Rohingyas in Myanmar or the widespread human rights abuses in the Philippines’ war on drugs. 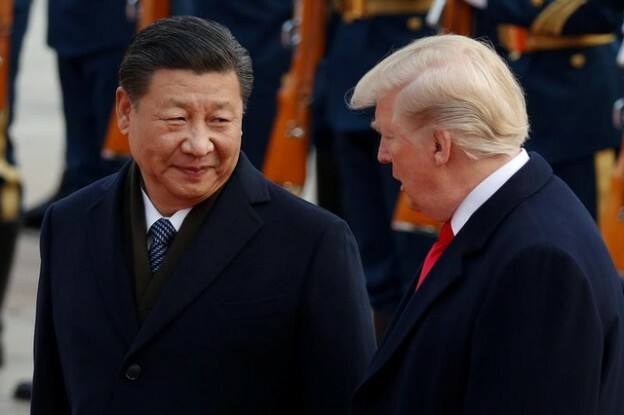 On climate change, something Trump had dismissed as a “Chinese made hoax,” the White House website early on removed all discussion of the issue as an element of US–China cooperation. Then the administration withdrew the United States from the Paris climate change agreement, damaging the US image in many Asian capitals. 16. Prashanth Parameswaran, “Time is Ticking on Trump’s Asia Strategy,” The Diplomat, July 6, 2017; Joshua Kurlantzick, “Except for Trade and Human Rights, Trump Hasn’t Upended US Policy in Asia—Yet,” World Politics Review, July 17, 2017; Colin Willett, “Trump’s Asia Policy Is More Confused than Ever,” Foreign Policy, June 12, 2017. 17. Prashanth Parameswaran, “Managing the US-Thailand Alliance in the Trump Era,” The Diplomat, October 11, 2017. 18. Matthew Pennington, “Tillerson: Preemptive Force an Option with NKorea,” AP, March 17, 2017; Matthew Pennington, “Trump Strategy on NKorea: ‘Maximum Pressure and Engagement,’” AP, April 14, 2017. 19. Observers from Taiwan also expressed this view in personal communications with the author. 20. Aaron Mehta, “‘Pivot’ to the Pacific Is Over, Senior U.S. Diplomat Says,” Defense News, March 14, 2017. 21. Simon Denyer, “Chocolate Cake and Chemistry Repair US-China Ties. But Will North Korea Spoil the Party?” The Washington Post, April 14, 2017; Nikhil Sonnad, “Trump Weirdly Says that ‘Korea was Part of China,’ Which Is Totally Wrong and Could Enrage South Korea,” Quartz, April 18, 2017. 22. “President Donald J. Trump’s Visit to Japan Strengthens the United States-Japan Alliance and Economic Partnership,” White House Fact Sheet, November 6, 2017. 23. Onodera Itsunori, “Strengthening Japan’s Defense Force,” Asia-Pacific Review 20, no. 2 (2013): 69-80; Jeffrey W. Hornung, “Japan’s Growing Hard Edge Against China,” Asian Security 10, no. 2 (June 2014): 97-122; Adam P. Liff, “Japan’s Defense Policy: Abe the Evolutionary,” The Washington Quarterly 38, no. 2 (Summer 2015): 79-99; Andrew L. Oros, Japan’s Security Renaissance: New Policies and Politics for the Twenty-First Century (New York, NY: Columbia University Press, 2017). 24. Mark Landler and Julie Hirschfield Davis, “Trump Tells Japan It Can Protect Itself by Buying U.S. Arms,” The New York Times, November 6, 2017. 25. “President Donald J. Trump’s Visit to the Republic of Korea,” White House Fact Sheet, November 8, 2017. 26. Julie Hirschfield Davis, “Fog Forces Trump to Cancel Visit to DMZ Separating 2 Koreas,” The New York Times, November 7, 2017. 27. Hajimu Takeda, “Former ‘Comfort Woman’ Hugs Trump at State Banquet in Seoul,” The Asahi Shimbun, November 8, 2017. 28. “Trump’s Speech to South Korea’s National Assembly [Full Transcript],” CNN.com, November 7, 2017. 29. North Korea’s fascist ideology of blood purity is described in B.R. Myers, The Cleanest Race: How North Korea Views the World and Why It Matters (Brooklyn, NY: Melville House, 2010). 30. Rick Gladstone, “South Korean Official Says Trump’s Visit Improved Relations,” The New York Times, November 19, 2017. 31. “President Donald J. Trump’s Visit to China,” White House Fact Sheet, November 10, 2017; Kevin Liptak and Jeremy Diamond, “Trump Trades Barbs for Flattery in Gambit to Win over China,” CNN.com, November 9, 2017. 32. “President Donald J. Trump’s Visit to Vietnam,” White House Fact Sheet, November 12, 2017. 33. “Trump Urges Vietnam to Buy U.S. Missiles,” AP, November 12, 2017; Justin Sink, Jennifer Jacobs, and Nick Wadhams, “Trump Chases U.S. Arms Deals in Asia to Help Him Win Re-Election,” Bloomberg, November 14, 2017. 34. Steve Holland, Mai Nguyen, “Trump Offers to Mediate on South China Sea,” Reuters, November 12, 2017. 35. “Trump Taunts Kim Jong Un on Twitter: “I Would NEVER Call Him ‘Short and Fat,’” AP, November 11, 2017. 36. “Trump Says He Believes Putin’s Election Meddling Denials,” CNN, November 14, 2017. 37. “Trump to Attend Three Asian Summits in November: Pence,” Reuters, April 20, 2017; Josh Rogin, “Trump to Skip Key Asian Summit in Philippines to Go Home Earlier,” The Washington Post, October 24, 2017. 38. Josh Rogin, “Trump Reverses Course, Decides to Attend the East Asia Summit,” The Washington Post, November 3, 2017. 39. “President Donald J. Trump’s Trip to the Philippines,” White House Fact Sheet, November 14, 2017. 41. It is unclear whether the issue actually came up in any of these meetings. The White House reported that it did, but most of the Asian governments denied that it had. See David Nakamura and Emily Rauhala, “Trump Boasts of ‘Great Relationship’ with Philippines’ Duterte at First Formal Meeting,” The Washington Post, November 13, 2017. 42. Tim Kelly, Nobuhiro Kubo, “As Duterte Embraces China, Japan’s Abe Set to Roll Out Warm Welcome,” Reuters, October 20, 2017. 43. Ankit Panda, “US, Japan, India and Australia Hold Working-Level Quadrilateral Meeting on Regional Cooperation,” The Diplomat, November 13, 2017. 44. Cary Huang, “US, Japan, India, Australia… Is Quad the First Step to an Asian NATO?” South China Morning Post, November 25, 2017. 45. Darren Whiteside, “South Korea’s Moon Unveils New Focus on Southeast Asia,” Reuters, November 9, 2017. 46. Michael Tatarski, “Countries Agree on Pacific Trade Pact that Excludes US,” Politico, November 10, 2017. 47. Kanga Kong, “North Korea Test-Fires ICBM That Could Put Entire US in Range,” Bloomberg, November 28, 2017. 48. Christine Kim and Hyonhee Shin, “B-1B Bomber Joins US-South Korea Drills as Tensions Escalate,” Reuters, December 5, 2017; Cristina Silva, “China Must Prepare for Imminent War with North Korea, Top National Security Experts Warn,” Newsweek, December 16, 2017; Keith Bradsher, “Near North Korea’s Border, A Chinese Paper Offers Tips on Nuclear Fallout,” The New York Times, December 6, 2017. 49. Michael D. Shear and Adam Goldman, “Michael Flynn Pleads Guilty to Lying to the F.B.I. and Will Cooperate with Russia Inquiry,” The New York Times, December 1, 2017. 50. Stephanie Peatling and Fergus Hunter, “China Scandal: Embattled Labor Senator Sam Dastyari Resigns from Parliament,” Sydney Morning Herald, December 12, 2017. 51. Ser Myoja, “Moon Ends Trip with Visit to Hyundai Plant,” Joongang Ilbo, December 18, 2017. 52. Andew Salmon, “President Moon’s China State Visit Spirals into PR Disaster,” Asia Times, December 15, 2017. 54. Matthew Strong, “Trump Appoints Taiwan Advocate Randall Schriver to Key Pentagon Post,” Taiwan News, October 28, 2017; Jonathan Cheng, “Trump Picks Korea Expert as Ambassador to Seoul,” The Wall Street Journal, December 11, 2017.